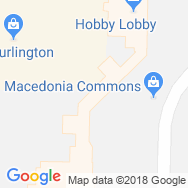 Rally House in Macdeonia, Ohio, 23 miles southeast of downtown Cleveland, is located on Macedonia Commons Boulevard in the Macedonia Commons Shopping Mall, in between OH-8 and I-271 Highways and E Aurora Road. Time to kick your old pro team gear out of your closet. Rally House Macedonia has everything you need to cheer your Cleveland Indians, Cavaliers and Browns to a victory! Whether you are searching for Cleveland Indians jerseys, sharp-looking Cavaliers hats or comfortable Browns apparel, Rally House Macedonia offers the most diverse collection of professional team sportswear. Discover men's popular t-shirt designs and the latest women's clothing trends while you stock up on your college team colors! Rally House Macedonia features your favorite NCAA sportswear and gear such as Cleveland State t-shirts, Ohio Bobcats drinkware, Kentucky State apparel and Ohio State sweatshirts for the whole family! Stop in today and show your colors! We know you love the Cleveland metro as much as we do. The late nights at Progressive Field, the chilly Sundays at FirstEnergy Stadium, and the action-packed games at Quicken Loans Arena fuel this city every day. Whether you're a local representing your city or a visitor travelling through, Rally House Macedonia has Cleveland shirts perfect for your style and Ohio souvenirs to commemorate your trip. Shop our local collections to represent Cleveland and remember O-Hi-O with Cleveland apparel, Ohio souvenirs, and even USA apparel. Regardless of which city, area or team you love to represent, we can all show our RALLY!